Black: Lightweight. just bit sheer.not too much. Handmade Cotton hair scarf. This one for someone does not like the elastic headband. Lightweight cotton. 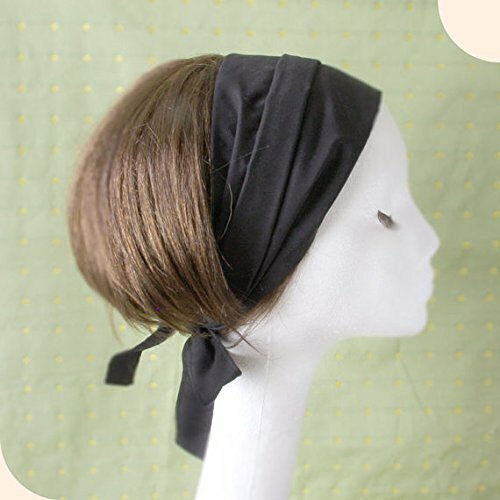 It can be wide or narrow hair scarf. You can choose the size. Looks very feminine with the long ribbon! Size approximately 8.5" wide 47" long (include ribbon part) *absolutely hand wash cold, line dry. No machine! Domestic customer, the shipping will be the first class mail with tracking #(USPS) If you need to add insurance, Priority or etc..., please contact me before you order. International customers, Import duties, and taxes are not included in the item price or shipping price. These charges are the buyer's responsibility. Please check with your country's customs office before your shopping. *Please read my store policy. View More In Hair Jewelry. If you have any questions about this product by Mercato, contact us by completing and submitting the form below. If you are looking for a specif part number, please include it with your message.